Have you ever felt like you were missing something? Well I found that something! All pumpkin bread that has ever been made… it’s wrong. 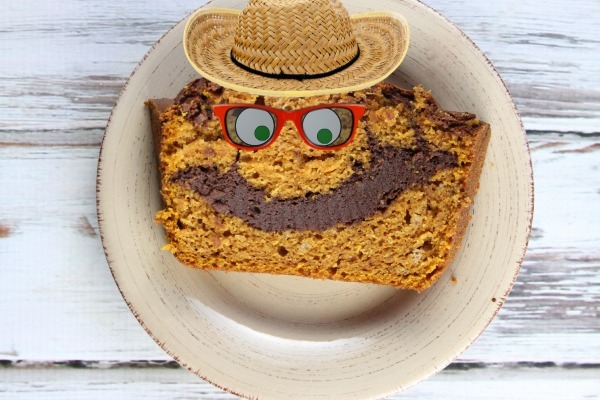 This week I created the ideal recipe for a new killer pumpkin bread. I stuffed a Nutella-Cheesecake mixture into my Mom’s classic pumpkin bread. 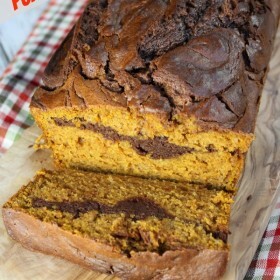 Therefore, I created the amazing, innovative, PERFECT, Nutella Cheesecake Pumpkin Bread. It might just be the best autumn recipe ever created! The pumpkin bread looks so cool! There’s a layer of Nutella cheesecake right at the center, so you can get some with every bite! This is one of the best looks of mine that my mom has caught on camera. It’s my “Can we please just stop taking pictures and let me eat?” face. 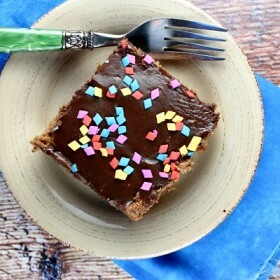 Because I love pumpkin bread, Nutella, and cheesecake, this is perfect for me, and probably many more people too! The loaf turned out perfectly. The swirl got a little messed up, but it was still absolutely yummy as heck. Does anyone know a good swirl technique besides just using a knife? The knife didn’t turn out that well when I swirled it, but it didn’t change a thing besides the slight appearance of the bread. The Nutella cheesecake in the middle looked like a smile! It was so cool. My mom decided to be creative and add glasses and eyes while editing this photo. 🙂 The bread is really moist. It has the perfect consistency and tastes great! Yeah, so if anyone has a good swirling technique please let me know. I’m very open to new ideas from all of my readers. This bread is fabulous, and completely OUT OF THIS WORLD while it is warm. It is almost ski season and I can’t wait! 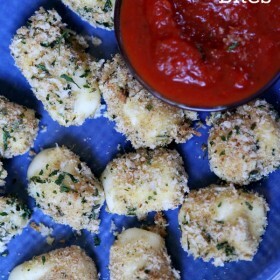 As the weather grows colder, this is the perfect after-school recipe. I would highly recommend making this. It’s the best pumpkin bread ever! 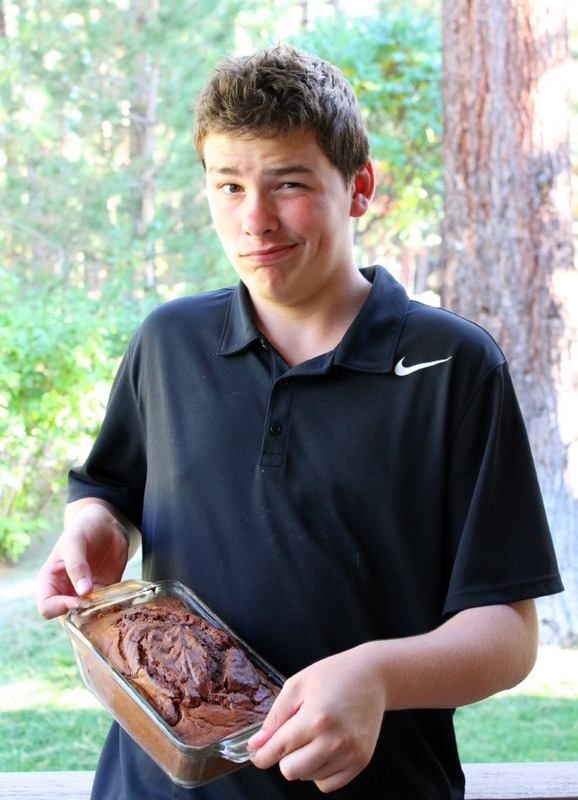 And even a kid can stuff Nutella into pumpkin bread… Like Me! 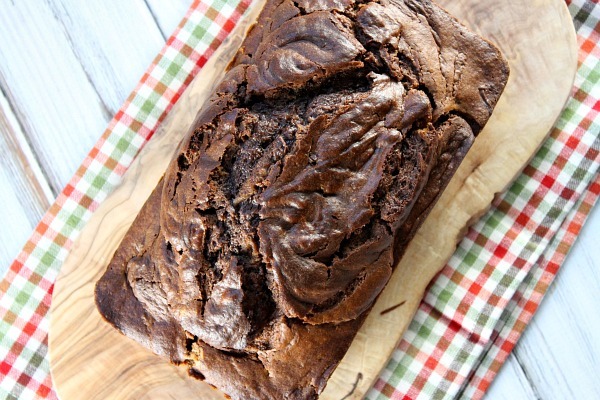 Seriously the best pumpkin bread recipe ever with Nutella inside!! 1. Preheat the oven to 350 degrees F. Spray a 5x9-inch loaf pan with nonstick spray. 2. Make the pumpkin batter: In a large bowl, whisk together the eggs, sugar and oil. In a separate bowl, whisk together the flour, baking soda, baking powder, spices and salt. Add the dry ingredients to the wet. Whisk together. Then whisk in the pumpkin and water. 3. Make the filling: In a medium bowl, use an electric mixer to combine the egg and cream cheese. Mix in the flour. Then mix in the Nutella. 4. Pour half of the pumpkin batter into the pan. Spoon most of the filling onto the pumpkin batter. Pour the rest of the pumpkin batter on top. Spoon the rest of the filling on the very top. Use a knife to swirl everything together. 5. Bake 60 to 75 minutes, or until a knife inserted into the middle of the loaf comes out clean. Cover the loaf with foil if it appears to be browning too quickly. **If you do not have pumpkin pie spice, you can use 1 teaspoon cinnamon, 1/2 teaspoon nutmeg, 1/2 teaspoon cloves and 1/2 teaspoon allspice. Looks amazing! You combined 2 of my favorites. =) i’m definitely going to give this a try. 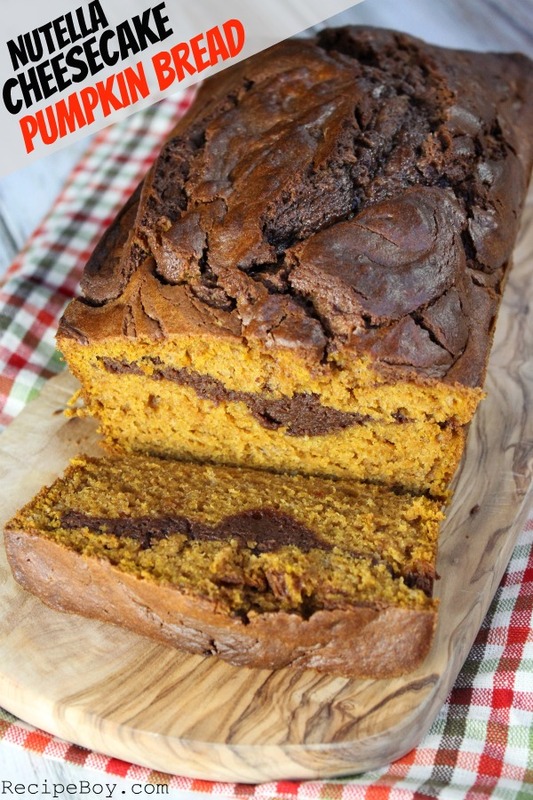 Nutella Cheesecake Pumpkin Bread? I’m in…Looks and sounds delicious! Funny how I have all the ingredients to make this. Yay! This bread looks so yummy!! I love the addition of Nutella. Looks great! I find that when you want to swirl something like Nutella into a thick batter, it is easiest to swirl it in the mixing bowl before pouring it into baking dish. Just add it to the batter, lightly swirl and transfer to dish. I use a chopstick or metal skewer to draw a wide S pattern across the short sides all the way down the loaf pan. This swirls just enough without over mixing the batter to make a pretty loaf. Yum. This looks awesome! I will have to try a gluten free version with my favorite GF flour (Cup4Cup). Thanks! I have found that when I make the S swirl as described by Sabine above, it helps to stop occasionally and pull the knife up and down in place. Nutella cheesecake inside pumpkin bread??? Seriously that is awesome!!! I can’t wait to try it for sure!! !